Anxiety after drinking is one of the little-known, and not often talked about, causes of anxiety attacks. Hangover anxiety actually ranks amongst the most searched anxiety attacks causes on the internet! I made an amazing guided meditation to help you heal anxiety after drinking… download Hangover Anxiety Meditation for FREE on MP3 now. Anxiety after drinking…isn’t it the worst? Or a wonderful day out and you’ve enjoyed some drinks and of course, once you start drinking, you want to drink more and you want to eat more and you’re having a wonderful time and you just drink more and more and more until suddenly, you’re not having such a wonderful time anymore. And often times, it results in you waking up the next morning feeling very much worse for wear, feeling hung over and tired and thirsty and sick. And this feeling of anxiety creeps up on you as well. I remember myself in my “drinking days,” as I call them, when I used to go out a lot back in my single days, I’d go out at times and I would wake up in the morning and I’d be checking my phone to see who I’d called the night before and who I text messaged the night before. And just this feeling of anxiety would be jest overwhelming and overpowering to the point that…I actually got to the point where I stopped drinking altogether for a while there and really curbed my partying ways and decided that that wasn’t for me anymore. That’s not what I’m recommending. What I do recommend is that you just gain some understanding about the nature of alcohol and how that contributes to your anxiety. So, it’s important to know that alcohol in itself is a depressant. Although, while you’re drinking at the time, it makes you feel really happy and chatty and confident, what it’s actually doing is it’s dulling your sense of reality, so to speak. It’s actually making your body slow down and you’re processing everything a lot more slowly. It slows down your metabolism and it really slows down your perception. So, while you’re drinking and while you’re drinking more, what you’re actually doing is putting that depressant into your body and causing dehydration. And dehydration is really what causes the anxiety after drinking. Besides all the toxins that’s in the alcohol that you’re consuming at the time, the number one cause of hangover is dehydration. And of course, what comes with dehydration? Rapid heartbeat, sometimes you get sweats, you definitely get trembling, you get feelings of nausea. And of course, what are these also symptoms of? They’re also symptoms of an anxiety attack. So, that’s important to note as well, that dehydration and hangover and anxiety attack or panic attack can often mirror each other in terms of the physical symptoms that you get with one another. 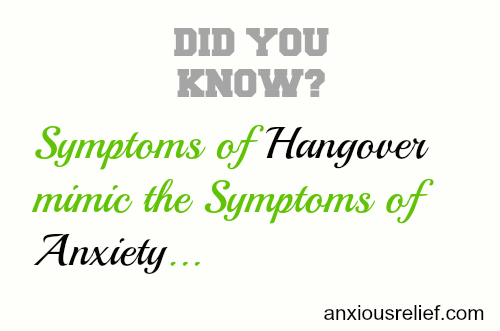 If you’re prone to an anxiety episode, then your hangovers can lead into anxiety and anxiety attack which leads to this whole vicious cycle of anxiety after your drinking. When you’re drinking, drink lots of water as well. Not only will this help to keep your alcohol consumption in check, it will also mean that your body has enough wonderful water and prevents dehydration. And if you think of water as being like white light, it really goes through and it cleans out your body on a physical level. So, your hangover in the morning won’t be quite as bad. I hope that gives you some help and some understanding of why your anxiety might be a little bit worse after you’ve been drinking. PS – I made an amazing guided meditation to help you heal anxiety after drinking… download Hangover Anxiety Meditation for FREE on MP3 now.